Sadly no bird news from me today. I had breakfast at 2pm and lounged on the sofa all afternoon and evening! I really wanted to get out and go birding, but I just couldn't. I couldn't get to sleep properly this morning and still feel exhausted from last night's Christmas Party. I am at work all day tomorrow, so need to somehow get fit again quickly! Fabulous Christmas Party with all my work colleagues at the 'Bank House' in King's Lynn. The food was incredible! To produce food of that quality for 38 people and with excellent service – 10/10! Fabulous night out with everyone. Dee's hair 'updo' was just a work of art! I work with so many beautiful people, some of whom could easily have just walked off the catwalk this evening! I love seeing everyone all dressed up and out of our boring uniforms. Most of us then went to 'Kudos' to dance. Highlight of the evening was Cilla's back flip on the dance floor!!! I left later on to go to 'Heights' as the music wasn't exactly brilliant in 'Kudos'. The music was better in 'Heights', but felt very guilty leaving everyone, so went back at just after 2am to join everyone for the last hour, but the bouncer wouldn't let me back in – they don't let people in after 2am!!! So annoying, especially as I could hear that the music had improved since I had left! Police were outside dealing with a fight that had broke out on the dance floor! Gemma and Sarah came out and we shared a taxi home. Currently munching on peanut butter and toast at 3.30am! Don't think I will get up until well after lunch. Getting on down at KUDOS, King's Lynn. The sound quality is atrocious though! I'm on here somewhere! Christmas Party at the Bank House Restaurant and then getting on down at KUDOS with Georgina, Fiona, Keri, Emily x 2, Rachael x 2, Penny x 2, Debbie, Dee, Jo, Daniel, Adam, Jane, Sarah, Gemma, Cilla, Chandi, Ghaya and others. Some crazy Twitchers I know are off to see this at the weekend – good luck! I noted whilst eating my lunch in the car today, that there seemed to be quite alot of bird action in the wood opposite me. There were 5 blackbirds just in one tree, which is unusual here. A pair of £1600 Swarovski binoculars were stolen from Lancashire Wetland Centre on the 24th November. Can you identify the man in the light grey hat in this video who appears to take them. Can you help? Email the name of the guy to: mail@viewpointoptics.co.uk and it will be passed it on to Lancs Police - or just call Crimestoppers (anonymously if you wish) on 0800 555 111. Remember Ronnie Haar singing at the Rutland Bird Fair this year? Here is his album 'Songs About Birds"
Hawk Owl in the Netherlands! Been at work today until 4.30pm and then decided to have a workout to Diversity's Dance, Fitness, Fusion DVD – so tired now! Note to self: must remember I'm not 18 any more! The video is huge fun, but a job to keep up with! The highlight on X-Factor tonight was watching Mary J Blige and Jessie J sing a duet – they were so incredible – Wow! The last couple of days have been exhausting to say the least. Father wasn't well, but he's ok now. Took mother shopping straight after work on Friday night and didn't get back to my house until gone 9pm – fell asleep on the sofa and woke up at 12.01am precisely. I could have slept all day today to be honest. I got up at a reasonable time, but then got back into bed, I felt so tired. I missed the best photo opportunities for the Parrot Crossbills at Holt Country Park this morning, when the light was better, but I made it over there by lunchtime. I had my best views of these awesome birds today and I saw 10+ birds in the end. 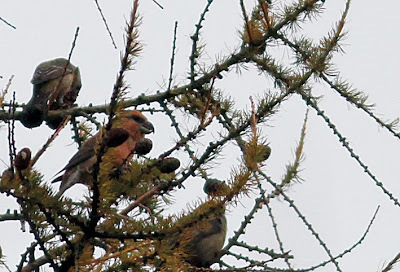 They were feeding on a tall larch and also on the adjacent pine tree – opposite the path that runs alongside the road (where I saw them last week). It was magical watching them picking off cones like sweets and carrying them effortlessly to the top most branches. I managed to get some better pictures than last week, but still nothing spectacular. Too far for my 300mm lens – too high up and poor light most of the time I stood here. It was raining on and off aswell. Walked round the park to the pond and back to the carpark. Sat and had a coffee by my car and then walked round again. Someone told me they never show much after 2pm – this seems to be the case, as I didn't see them any more. I really fancied sitting having a pot of tea and cake in the Cley Visitor Centre, so whizzed over to Cley and just made it by the deadline of 3.30pm! Had a lovely surprise when I got to the V.C. when I bumped into James and Simeon Grundy – it was great to see them and catch up. They were on their way to Norwich to join Connor for his 21st Birthday Celebrations – oh dear, sounds carnage! Look out Norwich and the girls!!! James and Simeon told me they were going to 'do some birding tomorrow' – yeah right!!! The piece of Cranberry & Orange Cake I had was particularly scrummy! Went to get my sea fix and drove to Coastguards. Scrunched through the shingle and walked down to the sea's edge – saw 2 Common Scoters flying west and a few gulls, nothing else of note. Pinkfeet flew overhead and lots of Brent Geese landed on the Eye Field. Popped into Holt to look at shoes, to see if I could find something more funky than the pair I already have for next week's Christmas Party, but didn't find anything exciting. Drove home. Seems like a very short day off, but then I didn't exactly get up very early! 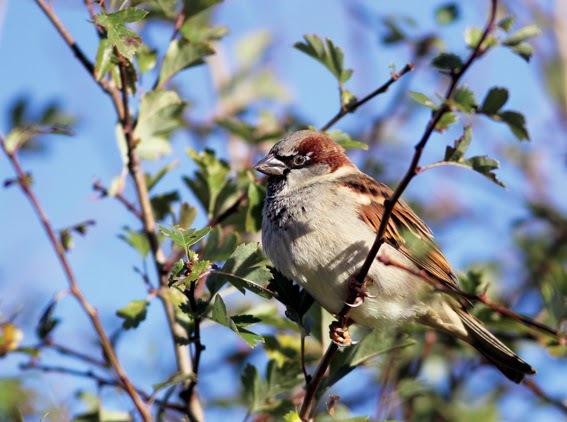 The county of Norfolk has one of the largest bird watching communities with an array of different habitats, which attract birds on migration to several key reserves located throughout the county. With this in mind Norfolk should be the logical place to stage its own bird fair and we are proud to announce the event will be held in the grounds of the beautiful Mannington Hall in 2014. The event will be lots of fun for the individual or family, interested in birds and wildlife, from the beginner to the hardened twitcher and we hope the charities such a the Hawk and Owl Trust and Norfolk Wildlife Trust will provide many activities for the whole family to enjoy. 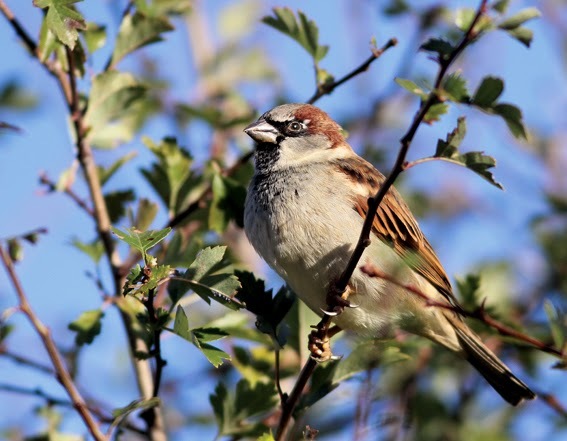 Our main goals are to provide an event for birders where they can look at the latest equipment from a variety of bird and wildlife related companies which will include optics, digital photography, holiday companies, photography and art work, books and field guides. We hope to attract both Canon and Nikon the two leading camera manufacturers, where the budding photographer can look and touch the latest digital camera and there will be a retailer where the equipment you looked at can be purchased. Around the marquees will be plenty of space for children’s activities, relaxing, and there will be plenty of opportunity to walk around the grounds of the Hall. Local and national experts will be offering lectures and there will be book signings and other activities throughout the weekend. The event is only six months away, but we are still busy looking for businesses, caterers, food stalls and charities to make the weekend a success for all. The roadworks outside the hospital this week are absolutely insane. It is taking approximately and hour and an quarter to get home and I live in King's Lynn!!! Anyway, when I eventually got out onto the main road, I went straight to Tescos to do a big shop, then onto a work colleague's house to collect a table and five chairs (very kindly given) to give to my parents. Mother and father's kitchen table is a joke and has been falling to pieces for ages. After loading up my car, I was amazed that the drop leaf table and 5 chairs all squeezed into the car! I was reluctant to go home, unload the car, then load up again to take to parent's at a later date, so whizzed straight over to Holme to deliver them. Parent's were very pleased with the table and chairs thank goodness. Loaded up car with their old table and chairs. Went to Ringstead farm to buy a a bag of sticks for mother's fire and delivered them, now 10.30pm! Drove back to King's Lynn and off to the dump in my lunch tomorrow to get rid of old table and chairs. PHEW! At Felixstowe Ferry, Suffolk on Golfcourse at 3.40pm but no further sign by dusk. TWO HUMPBACK WHALES IN NORFOLK! How incredibly annoying that this mega bird should turn up on a Monday. I have been waiting and hoping that Norfolk would get at least one mega this autumn, but was praying it didn't turn up when the clocks changed or on a bl**dy week day!!! The north east winds yesterday afternoon were playing on my mind – was it too late to produce anything exciting? No, it wasn't! North east again from Thursday until the weekend and the following week – may add some more excitement! Arrived at Holt at just after 8am. 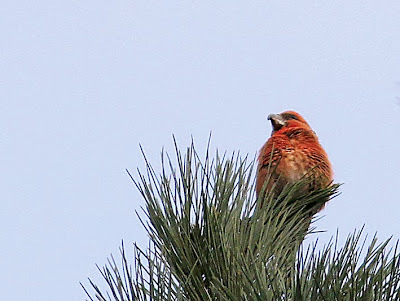 Parked the car by the Edgefield sign and spent an hour and a half searching Holt Lowes for Parrot Crossbills. I didn't see any birds of note at all. The only unwanted excitement was an alsatian bounding about all over the place and barking, which really unnerved me – I spent most of my time trying to avoid this dog! I was hoping that I might be really lucky and see some crossbills drinking from the pond. Bumped into one other birder who had also found nothing. Almost back to the car and the pager bleeped up with Parrot Crossbills at Holt Country Park and then another message with them being in the clearing opposite my car. Made my way to the clearing, but I only saw Common Crossbills here – the 'Parrots' had flown further back into the pine copse when I arrived on the scene. Joined the crowds to watch 6 Parrot Crossbills at the top of a pine, along the path that runs alongside the road in Holt Country Park. The light was dire for photography and I didn't obtain any decent shots at all. But even with the poor light I had fantastic views of these monster billed birds! 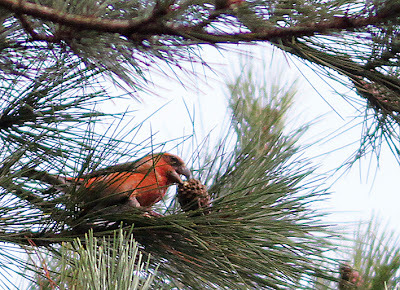 Sadly though I left at the wrong time – I was told later that 5 minutes after I left, the Parrot Crossbills had flown through into the carpark and were on a lower pine and in better light. Went to Cley briefly – saw a Stonechat from the West Bank (Beach Road) and then went to search for passerines in Stiffkey Campsite Wood and Garden Drove, Warham Greens – apart from two blackbirds found nothing at all of note. PARROT CROSSBILL & A Surprise Bird! Arrived at Holt Country Park to find the carpark almost full. Lots of birders waiting and hoping to catch a glimpse of the Parrot Crossbills seen here in the week. Lots of familiar faces here including Julian B., Andy S., Paul W., Jim S., Andy W. etc etc. Walked off to the pond area with Andy W. to search. 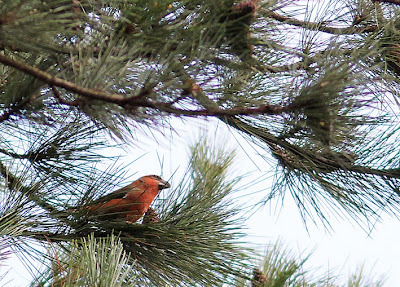 Phone call from Julian B. to say he had a Parrot Crossbill sitting in a pine almost above his head, along with Jim S.!!! We flew back to the carpark and drove just down the road to the clearing opposite the Edgfield sign (where the Roller was). The Parrot Crossbill along with approx 15 Crossbills had flown over to the single tall tree stump in the middle of the clearing and were difficult to ID from where we were standing, but we did finally see the female Parrot Crossbill amongst them! 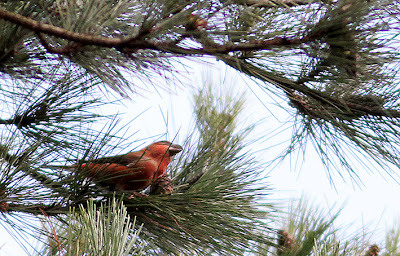 The flock then moved to the distant pine trees and then magically flew to the pines just to our left where we and lots of other birders had spectacular views of one female Parrot Crossbill – a new bird for me, so exciting! There was no mistaking this bird with its bulky beak and neck – stood out from the crowd so to speak! 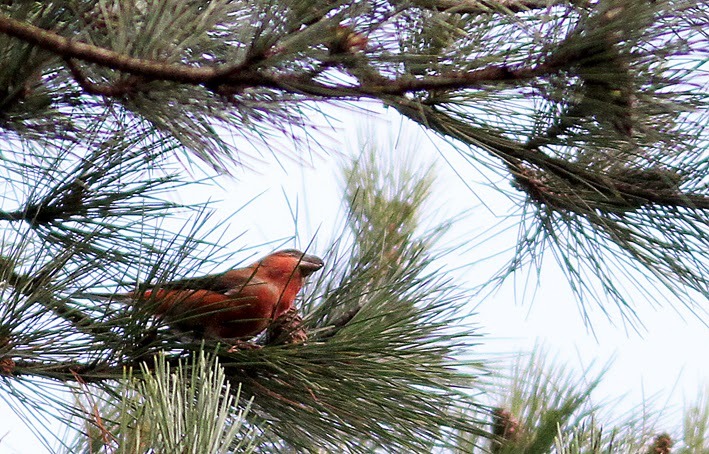 There was much discussion over a male Crossbill which was obscured from view most of the time. Whilst here, there were also 2 Red Kites. The light was absolutely dire for photography with dull grey, lifeless skies. Drove back to Holt Country Park to have a coffee. A message came up on the pager to say that there were 12 Parrot Crossbills at the clearing, at the time we had been there. We certainly did not see 12! Not saying that somebody didn't see 12, but there certainly wasn't 12 when we and lots of others were there at that time. Cley Visitor Centre for late lunch with Andy W. and the usual fun banter with Pat. Our lunch was interrupted by news of a Red-breasted Flycatcher at Coastguards – really?! I didn't quite believe it to be honest, but Andy and I finished our sandwich toasties pretty quick, just in case. We then quickly got up to make a sharp exit. As I was about to walk past the reception desk a man was showing a picture on the back of his camera to the lady that works there – she kindly called me over to look at the picture – OMG, there on the back of the camera WAS a Red-breasted Flycatcher!!!! I flew down those stairs and ran to the car. Andy got a lift with me and I scorched up to Beach Road. I stopped by a row of birders standing by the Cattle Pen, as this is where I had heard it was earlier, but they were looking for geese when we asked. Flew up to Coastguards to find several people had been looking and had not re-found the RB Fly. Mark G. Richard M., Andy St. and several others looking – nothing! The finder of the bird appeared amongst us and said he had first seen it on the shingle by the pill box looking exhausted, then on the low fence wire where he photographed it (picture HERE). The Red-breasted Flycatcher then made its way west, where he and his wife saw it again on the fence wires in the carpark!!! (mortified) It then flew south over the Eye Field. I walked east over the West Bank along the shingle for a short distance (towards BP) just in case, but found nothing. Mark G. phoned me (he was standing on the West Bank) to point out that a stonking male Hen Harrier was flying west not far from where I was standing – fantastic, but brief views only of this lovely bird, but it melted away when I lifted the camera! Walked to Daukes Hide with Andy W., Pete S., Steve West etc just in case the RBFly had re-located there, but nothing. Went back to the car and was told all the gulls had left the NWT hides and headed for North Scrape. Went back to Coastguards and ended the day walking to North Hide with Andy W. to look at gulls, but light failing rapidly at 4pm and didn't see anything exciting apart from two Pintail. Left work late tonight, whizzed round someone's to get their deposit for works' christmas party, whizzed home, whizzed back to restaurant to pay the balance and then back home, two phone calls and now I'm blogging – no time to eat and now its time to sleep. I was so stressed this week about so many things, I decided to treat myself and have the entire weekend off! So looking forward to a stress free weekend! I notice a Leach's Petrol has been seen at Cley today, will I EVER get to see one?!!! Northern Harrier, Parrot Crossbills to see, busy, busy bee! 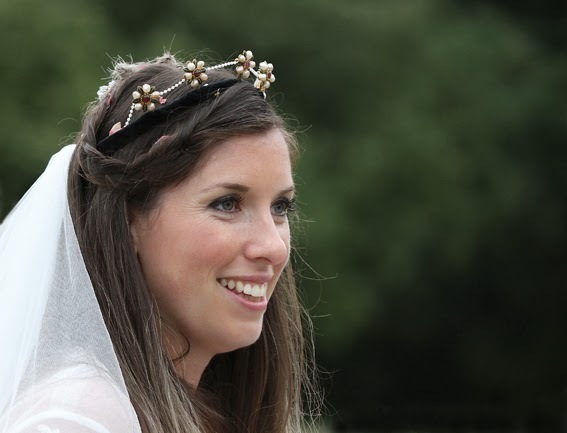 Thanks for plugging my blog Lucy! For fifth day, identified from photographs. See discussion HERE and pictures shown here and thought to be a Lesser Whitethroat!!! Stonking Pictures HERE. Also another mega, a MYRTLE WARBLER found dead at Southampton Western Docks. THAYER'S GULL, Pat's Pool at dusk, Cley NWT – FIRST FOR NORFOLK! HUMPBACK WHALE seen again 10.24am, 12.10pm & 1.42pm at Sea Palling! Straight into the hairdressers after work at 5.15pm, left at 8pm with new hair do for christmas parties! Then onto Tescos - oh joy! Home at 9pm and then trying to sort out our works' christmas party which I have been collecting the money for - stressful is an understatement. Note to self: next year if I get involved in this - tell a big fat lie and say I need the money two weeks before I actually need it! Just heard that some nasty driver knocked into my mother whilst she was cycling to the farm shop at Thornham and didn't stop. If only I had seen them - I WOULD have caught them!!! It must have been the wing mirror as she felt 'something hit her shoulder', she didn't fall off her bike, which I don't quite understand how she didn't! Tough cookie my mother! Two builders witnessed it and asked if she was ok, but no one got the number of the car, which is very frustrating!!! It was a burgundy coloured people carrier so mother said. I am fuming! Shattered now, no tea, no jobs done and its 10.55pm!!! Typhoon Haiyan – The Biggest Storm in History! I felt the tears rolling down my cheeks when I watched the 6 'o' clock news tonight. My heart goes out to all those families that have lost loved ones and to all my Philippine colleagues and friends who must feel utterly devastated at the mass destruction and loss of life this monster storm has caused. We are scrapping 'Secret Santa' at work this year and donating the money via one of our Filipino colleagues, who's family live in the Philippines. More ideas are being planned currently. I know none of us are 18 any more, but Vivien will always be my sweet little baby sister! My plan was to arrive at Salthouse at dawn, photograph the Grey Phalarope at sunrise – take awesome shots, seawatch, have a hot cheese scone at the Cley VC and then wherever the fancy took me after that. So – this is what actually happened! The alarm went off at 5.30am – bashed the alarm and shut my eyes...... a few moments later it was 7.45am!!! I woke up in an angry, grumpy mood. Cross, that I bashed the alarm down, and cross because of several annoying things going on, which I can't really discuss on here. My mood worsened with the 'no news' on the Grey Phalarope at Salthouse. I was sooooo looking forward to watching this bird and photographing it – bl**dy typical – Friday night bunk!!! 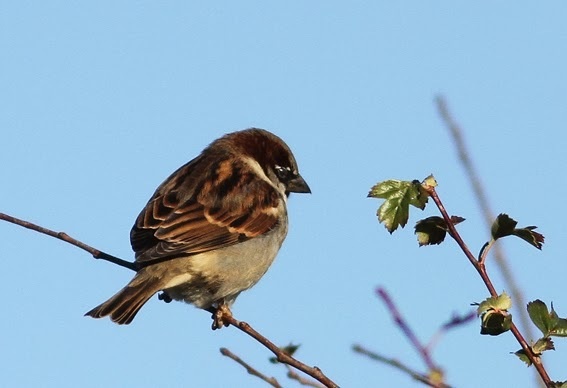 The only decent bird to see on my day off and it had gone – grumble, grumble, grumble. I just could not be bothered to make sandwiches. Made a flask and left the house after 9am. Bought a quorn slice from Asda and went to Roydon Common to look for the Great Grey Shrike. If there were no other birders here already, I wasn't going to stop. I don't mean that in a lazy way, but I'm not exactly in love with this place, its bleak and often dead boring. I have spent hours wandering round here seeing nothing and with short days, I didn't want to spend any more time here than was necessary. Fortunately, as I pulled up into the carpark, Jim Swalwell had also just arrived and moments later Steve West and friend also joined us, so we all went off together in search of the Great Grey Shrike. We could hear Common Buzzards calling and a Golden Plover flew overhead also calling. As we walked along the path amongst the heather, I did not feel we had a hope in h*ll of seeing this bird, BUT we got really lucky when I spotted the Great Grey Shrike perched on a big birch stump at 9.55am. Another birder we bumped into moments after we found it, said he had been searching for the shrike for the last hour and a half! The shrike didn't stay on the stump for very long and zoomed off to perch on a small pine tree, where we watched it hover momentarily and then off again into a bunker and then again onto a hawthorn along a fence line. The shrike spent a bit of time in this favoured spot, flying down to the ground to feed and then back to the hawthorn. Some dog walkers appeared where the shrike was a bit later and I couldn't re-locate it. Jim and others had left. A huge flock of Redwings flew overhead – difficult to estimate how many, but at least 50+. I walked back alone and realised that the shrike had re-located to a hawthorn not far from the carpark. which is where another birder was watching it through his scope. Exciting news came on my pager: 'Norfolk Humpback Whale north past Waxham again'. OMG – I had just had to go, I wanted that Whale! I speed walked past the hawthorn bush where the shrike was only moments ago, but it was nowhere to be found – obviously sneaked off low over the heather somewhere. Any photographers thinking they are going to get a full frame picture of this bird, think again! You'll be lucky to digiscope it never mind photograph it. I didn't even get a blob on the camera! Sat Nav: Destination: Waxham – Go! As I drove along, another message came up to say the Humpback Whale was now off Sea Palling but distant at 12.15pm – it was still there, how exciting! 57.5 miles later I arrived at Sea Palling, turning down Beach Road and then taking a left turn along a narrow road alongside the pay and display carparks. I continued along the road and turned right at a junction and then followed the road up until a campsite sign and parked the car along the verge. It was raining lightly and was freezing cold. I climbed up to the high dunes to overlook the sea and rocks below. I stood here for what seemed like ages. Saw a bonxie, an auk sp., gulls, several flocks of Starlings in off the sea, but nothing much else. My heart sank. There was no one else here, no whale, it was seriously cold and the rain was now much heavier. I left and trudged back to my car. Met Paul W. who's car was parked next to mine who told me the Whale was being seen with gannets from the main entrance to the dunes, by the shops, cafe's and carparks. I re-located and parked in the cafe carpark. Walked up to the dunes and found a few other birders looking for the whale including Tim Allwood! To be expected really, it's Tim's patch! A few gannets going past, but no sign of the Humpback Whale. Everyone left eventually and I stood alone. The pager bleeped up with news of the Whale being seen at Waxham at 2.47pm! Off I zoomed! I parked at Shangri La Cottage at Waxham and walked up to the dunes to join a lady called Alison Allen who had very kindly put the news out (thank you so much) and Marcus Nash. Marcus kindly pointed out where he had last seen the whale a few moments ago. I looked through my scope to watch several gannets on the horizon. Then, suddenly I witnessed a tail splash – it was 3pm and I had just seen my first HUMPBACK WHALE OMG!!! – in fact the first whale I had ever seen and here it was in my home county of Norfolk – how awesome was that!!! I just couldn't believe my luck. My mood soared to a euphoric state! Ok, so it was distant, very distant as in on the horizon and you needed your scope and no I didn't get the camera out of the bag – there was no question of a record shot, BUT I had seen it. I watched the whale again, this time breaching and then another tail splash – I was smiling away to myself. I felt like I was watching a disney movie watching that tail flick up on the horizon, it was like a beautiful dream. So worth the 116 mile round trip, the cold, the rain and the waiting!!! A Bonxie was also seen, several Common Scoter and more Starlings. Duncan Mac. joined us who also saw the whale. We watched it up until 3.45pm (I think it was). Marcus left and then Alison. Then Duncan left and Tim Allwood joined me – nice to catch up. The light was now dire and I didn't see it any more. Walked back to the car, had a coffee and then drove home. It took forever to get back, its a long way to King's Lynn from Waxham! I REALLY regret booking shifts tomorrow. If I wasn't working I would be back at Waxham again for the entire day, with flask of coffee and camera in hand. Top tip for anyone going tomorrow – look for the gannets, keep focussed on them and watch for the tail coming up! I took 485 pictures and have only just had time to start selecting and editing them. This is the first one of many and these will be added to my post HERE. The weather doesn't exactly look very kind tomorrow, but glorious on Sunday when I'm working all day! I wouldn't have minded at all if it had been north west with rain – I'd have been first at 'The Leas'! South West with rain and sun tomorrow and North West with sunshine all day on Sunday. That's the wrong way round for goodness sake! Much more favourable it was south west winds and sunshine all day and then rain all day with North West Winds!!!! Norfolk’s Humpback Whale Captured By James! Rain all day and a torrential downpour just now at 10.20pm. Fed-up with the dire weather and dark nights already. Fed-up with working, want to retire and 'do lunch'. There are so many months to go before spring. No Mega's anywhere over the last couple of day's. Autumn migration has finished. Winter has arrived. Do I sound fed-up? Well, yes I am! What I really need is a holiday, a proper holiday with white sands, turquoise seas, sunshine and sunsets, palm trees, a hammock, good food, being waited on and pampered on my own private island and beach! Dream on Penelope...... Better buy that lottery ticket! 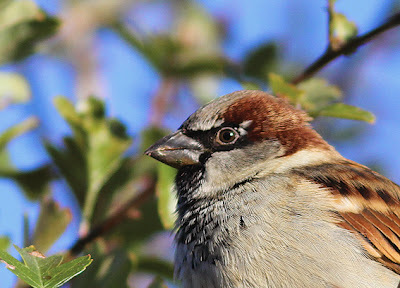 House Sparrow – Old Hunstanton. When I stepped out of the house this morning, I hadn't realised how cold it was and promptly returned to add some more layers! It was glorious sunshine, but decidedly chilly today. I had this really silly idea that I was going to have a frame filling shot of a Yellow-browed Warbler today – ha ha! I must admit that I wasn't exactly sure where 'Linksway' was in Old Hunstanton – it is in fact a hotel which is at the far end of 'Waterworks Road' which is the road adjacent to 'Caley Hall Hotel'. I parked the car fifty yards along 'Waterworks Road' and walked to where yesterday's Yellow-browed Warbler and Firecrest were seen. On route there was a lovely flock of House Sparrows sitting in a hedgerow opposite a large house and garden. Just before 'Linksway Hotel' is 'Bridge House' (on your right) with several willow trees, a sycamore and bramble bushes. It was these willows were the YBW and Firecrest were seen yesterday. It was 9am when I arrived – I didn't think I had a hope of seeing any birds in these willows as it was really windy and very cold. At 10am I had a good, but short view of the Yellow-browed Warbler on a dead branch, just in front of the large sycamore – but sadly not seen long enough, to capture on my camera. No sign of the Firecrest. Connor and Billy Rand turned up and also four other birders, but that Yellow-browed Warbler did not show any more – very frustrating and to my knowledge didn't show any more today – I stayed until 11am and gave up. Several starling flocks flying west. Coffee, cheese scone and catch up with a friend in 'Byfords' Cafe and Restaurant. I walked along the 'East Bank' to find the Shorelark which was seen earlier today. Grey Plover on route, Little Egrets. Walked east along the shingle bank as far as 'Sea Pool' and back. Meadow Pipit, Skylark, flock of 21 Snow Buntings and 8 Gannets sitting on the sea, but no Shorelark. Yellow-legged Gull – Cley NWT. 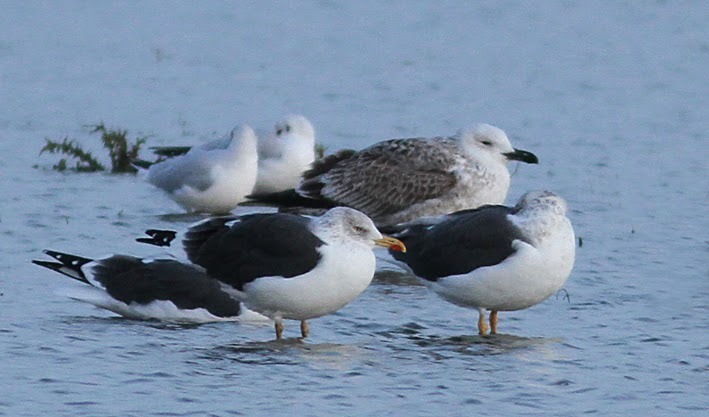 5 Whooper Swans, a Polish colour-ringed Caspian Gull (see ETM's Video HERE) and a Yellow-legged Gull on 'Pat's Pool' from Teal Hide NWT later this evening. As always, a beautiful sunset to finish the day with the 5 Whooper Swans flying through the orange skies inland at about 5.30pm. MEGA!!! CAPE MAY WARBLER remains on Unst, Shetland! It's my Father's 87th Birthday Today! I had a lovely day with all my family at the 'Clarke Residence' at Holme. I didn't think father would cope with four females all day, but he managed us well!!! Old friends and NOA members Audrey and Maurice phoned up to wish father happy birthday, which was really nice of them and it made my day, when father indicated to me that he wanted to chat with them on the phone – he rarely answers or speaks on the phone now adays, so it was lovely to hear him conversing with some else, other than his family. Father had lots of presents, including his usual request of chocolates, a new cardigan and a coat. Birthday cake and singing commenced at tea time and lots of slimline (not) food was consumed by all! We left our parents to have a peaceful evening at 7pm. I dropped Lucy home and then took Vivien back to Ely as her bag of birthday presents was too heavy for her to manage on the train, I decided. The wind was pretty scary as we drove to Ely – items were hitting the car windscreen, don't know what they were!!! It was great sitting in Vivien's flat and having a girly chat – I really should spend more time with my sisters instead of devoting my entire time to birding! I naughtily didn't book any shifts tomorrow, so I am out birding all day!!! It's been an absolutely rubbish week. A few of my work colleagues are going through some shocking and distressing things over the last few days, my heart goes out to them. Life is absolutely disgustingly unfair at times – so unfair and to the nicest of people. I have spent the last couple of nights after work, whizzing around, getting presents for my father and youngest sister Vivien's birthday – its all go! Tiring week consisting of several nights of collapsing on the sofa with exhaustion as soon as I got in the door! Still no 'easterlies' on the cards for Norfolk this weekend – oh well, that's the way it goes I suppose! As for the Humpbacked Whale – why oh why, couldn't it of hung on just a little bit longer!!! I would have loved to have seen that! MEGA!!! CAPE MAY WARBLER remains for eighth day on Unst, Shetland!